Heinz Field, home to the Pittsburgh Steelers, is a monument to Western Pennsylvania football tradition and, especially, to the fans. To understand just what Heinz Field represents to the Pittsburgh Steelers and the city of Pittsburgh, however, you first have to understand the events which brought us to this day. The Steelers' roots in Pittsburgh date back to July 8, 1933, when they were founded under the name Pittsburgh Pirates by Arthur Joseph Rooney. They were a member of the Eastern Division of the 10-team NFL, five of which remain: Pittsburgh Steelers, Chicago (Arizona) Cardinals, Green Bay Packers, Chicago Bears, and New York Giants. The Steelers were not always the thriving team that they are today, however. In their first seven seasons, the Pittsburgh Steelers won only 22 games. Professional football just wasn't a priority in Pittsburgh, where baseball and college football was much more popular, so Art Rooney often took the Steelers away from their home at Forbes Field, and on the road to cities such as Johnstown, PA; Youngstown, OH; and New Orleans, LA. Through it all, Rooney never faltered in his resolve to make pro football successful in Pittsburgh. In 1938, Rooney offered Colorado All-American Byron "Whizzer" White a $15,800 contract, making him the NFL's first 'big money' player. Two years later, in an attempt to generate some fan support and involvement, the football team changed its name to the Pittsburgh Steelers, in recognition of Pittsburgh's proud steel heritage. Yet it still took two more years before the Steelers, thanks to rookie Bill Dudley who led the NFL in rushing, enjoyed their first winning season. The following years saw the Pittsburgh Steelers merged with the Philadelphia Eagles "Steagles" (1943) and Cardinals "Card-Pitt" (1944) as football rosters became depleted by World War II. The Steelers first chance at a division title came in 1947 under coach Jock Sutherland as the Pittsburgh Steelers finished in a tie for first place in the NFL's Eastern Division with the Philadelphia Eagles, who beat the Steelers in a playoff game 21-0. From 1957 to 1963, the Steelers, led by quarterback Bobby Layne, defensive tackle Ernie Stautner and running back John Henry Johnson, were again division contenders but continued to come up short. The 'dynasty years' of the Pittsburgh Steelers were still a decade away. Two significant changes took place in 1970, when the Pittsburgh Steelers, under the leadership of coach Chuck Noll, moved from the NFL to the AFC Central with the merger of the American Football League and the National Football League, and also moved into their new home at Three Rivers Stadium, named after the three rivers (Allegheny, Monongahela, and Ohio Rivers) that converge at downtown Pittsburgh. Previously, the Steelers had played home games at both Forbes Field and Pitt Stadium (home of the University of Pittsburgh Panthers) from 1958-63 and, exclusively at Pitt Stadium from 1964-69. Many think Three Rivers Stadium brought good luck, as the Pittsburgh Steelers' first-ever division title came in 1972 with an 11-3 record. In the first playoff game at Three Rivers, the Steelers defeated the Oakland Raiders 13-7 and advanced to the AFC Championship Game (which they later lost) with Franco Harris' "Immaculate Reception," perhaps the most famous play in NFL history, during the final minute of the game. The Pittsburgh Steelers, led by Hall of Famers Terry Bradshaw, Franco Harris, Mel Blount, Joe Greene, Jack Lambert, and Jack Ham, again reached the playoffs in 1973, winning the Super Bowl the next two seasons. After missing another chance at the Super Bowl with playoff losses in 1976 and 1977, the Steelers won the Super Bowl again in 1978 and 1979, becoming the first team in NFL history to win four Super Bowls and the only team to win back-to-back Super Bowls twice. With six consecutive AFC Central championships, eight straight years of playoff appearances, and four Super Bowl championships, the Steelers were affectionately dubbed as the "Team of the Decade" for the 1970s. 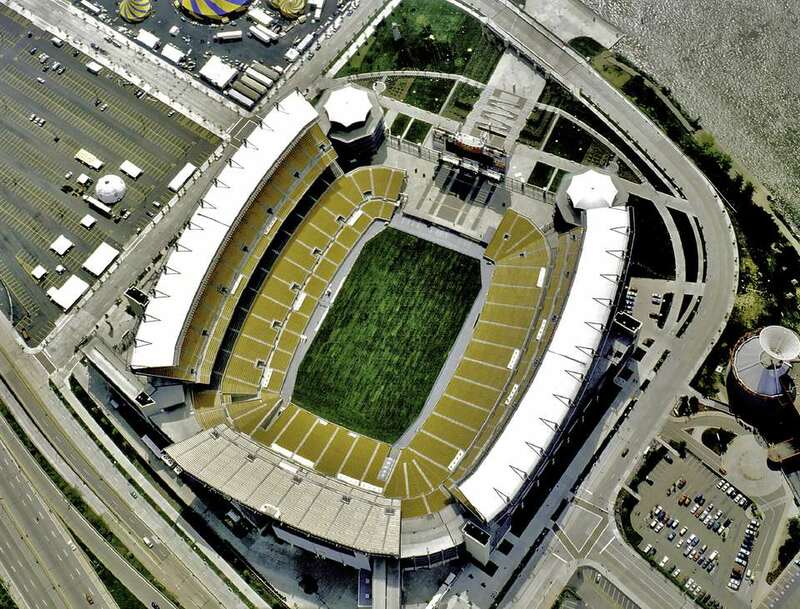 The newest chapter of Steelers history began in June of 1998 with the official ground-breaking for Heinz Field, the new 64,450-seat home of the Pittsburgh Steelers and Pittsburgh Panthers. The gates to Heinz Field were officially opened in August of 2001 for seasons of thrills and excitement that will provide a lifetime of memories for generations of football fans. Beyond the South Plaza, Heinz Field's horseshoe shape allows for a beautiful view of the city's unique skyline and the fountain at the Point. Dan Rooney, son of Steelers founder Art Rooney, looks at Heinz Field as the Steelers' "thank you" to the loyal fans who made them one of the best football franchises in history - a beautiful, intimate home where "every seat is a good football seat." Heinz Field is the perfect blend of modern-day amenities and fan-friendly charm. The two-tiered stadium offers more intimacy than many NFL venues, with natural grass, great sight lines and a wide-open view of the football action set against the beautiful backdrop of downtown Pittsburgh. There is no such thing as a bad seat in this football-oriented stadium which was obviously designed to take football from a game to an experience. 2.2 acres of natural bluegrass provide an authentic football experience. The Steelers and Panthers don't have to contend with a frozen playing field either, since an automatic heating system, consisting of over 35 miles of tubing, lies just beneath the grass surface and maintains the field at a constant 62 degrees. 7100 club seats tucked between the two levels on both sides of Heinz Field offer a fantastic vantage point and access to the two three-story club lounges. These popular lounges feature a wall of glass from floor to ceiling for nearly the entire length of the building, a huge video wall, a variety of seating, beverage kiosks and specialty-food stands. The open bowl shape of Heinz Field offers breathtaking views of downtown Pittsburgh, one of America's most scenic cities. Point State Park, the Hilton Pittsburgh and Towers, PPG Place, Fifth Avenue Place, the Fort Pitt Bridge, Duquesne Incline, and the Ohio River are all within view leaving visitors no doubt that they are watching the game in Pittsburgh. Reflecting Pittsburgh's steel legacy, steel is a primary building material in Heinz field. The majority of the steel is silvery grey in color, except for the large gold-painted 'quad pods' which support the upper deck. Large masonry anchors Heinz Field, echoing the heavy stone bases of Pittsburgh's downtown landmarks and bridges, such as the City-County Building and the Allegheny County Court House. Progressing up the stadium facade, the building gradually changes from steel and stone into walls of glass which reflect downtown skyscrapers such as PPG Place and Fifth Avenue Place, both of which are visible from inside the stadium. Fans entering Heinz Field through Gate B come into the "Great Hall," which celebrates the rich football traditions of both the Steelers and the University of Pittsburgh. On display, fans can view the four Super Bowl trophies, large pictures of former Steeler greats and lockers of the Hall of Famers. Fans will also enjoy the interactive games and attractions as well as the usual selection of food and souvenirs. Heinz Field brings together three enduring Pittsburgh icons: Heinz was founded in 1869; the University of Pittsburgh's first football game was in 1889 and the Steelers' first game was played in 1933. The huge stadium scoreboard is flanked by two giant neon Heinz Ketchup bottles which virtually "pour" onto the screen whenever the home team drives into the "Heinz Red Zone" - the area between the 20-yard line and the goal line. If these bottles were filled with Heinz Ketchup, they would contain 1,664,000 fluid ounces each - enough to give fan at least one 14-ounce bottle of ketchup to take home. Pittsburgh's North Shore, home to both Heinz Field and PNC Park, is still very much a work in progress. Millions of dollars of development are planned to take place over the next few years. For now, there isn't much in the way of nightlife right on the North Shore near Heinz Field, but the area is growing like wildfire and already offers several great options for a few hours of relaxation and fun. Plus downtown Pittsburgh, the Strip District and even Station Square are just a quick walk, bus, or boat ride away. Dining and drinking: Looking for a place to unwind and get a bite to eat before or after a game? Pittsburgh's North Shore offers a great mix of new twists and old favorites. A Pittsburgh game-day tradition, the Clark Bar & Grill housed in the historic Clark Candy Factory across from Heinz Field, is the ultimate scene for the true Pittsburgh sports fan. Another popular sports bar is Castellano's Deli which, in its new location across Federal Street from PNC Park, offers sports fans plenty to drink, great deli sandwiches and lots of Pittsburgh sports memorabilia. Other popular taverns include the Triangle Bar & Grill, Firewaters and the 222 Bar. If you're willing to walk or drive a few blocks, then consider the James Street Tavern on Pittsburgh's historic North Side, which offers great New Orleans jazz and Cajun/Creole cuisine, or Legends of the North Shore if you're in the mood for Italian. Active entertainment: Want to work off some energy after the game? Then try one of the North Shore's newest hot spots, the Hi-Tops Sports Bar for great food, drinks, and fun. Or maybe you'd rather cruise down an Olympic bobsled run or shoot hockey pucks at a virtual goalie? Then check out the don't-miss UPMC SportsWorks, packed with over 40 exhibits featuring 70+ interactive experiences designed to test your skills in virtual games and sporting events. A bit of culture: Tom Sokolowski, director of the Andy Warhol Museum, suspects that sports and arts crowds come from different planets, but I'm not so sure. One of the most comprehensive single-artist museums in the world, this North Shore institution contains 35,000 square feet of exhibition space on seven floors featuring the work of one of the most influential American artists of the 20th Century. It provides interesting insight into contemporary art and popular culture and is definitely worth at least one visit. Hands-on science: The Carnegie Science Center is located right next door to Heinz Field. Fun for kids of all ages can be found here with more than 300 hands-on exhibits, a four-story Omnimax Theater, interactive planetarium, a real submarine, and three live demonstration theaters. One of the top ten Science Centers in the country! What Is the Pennsylvania Individual Income Tax Rate?